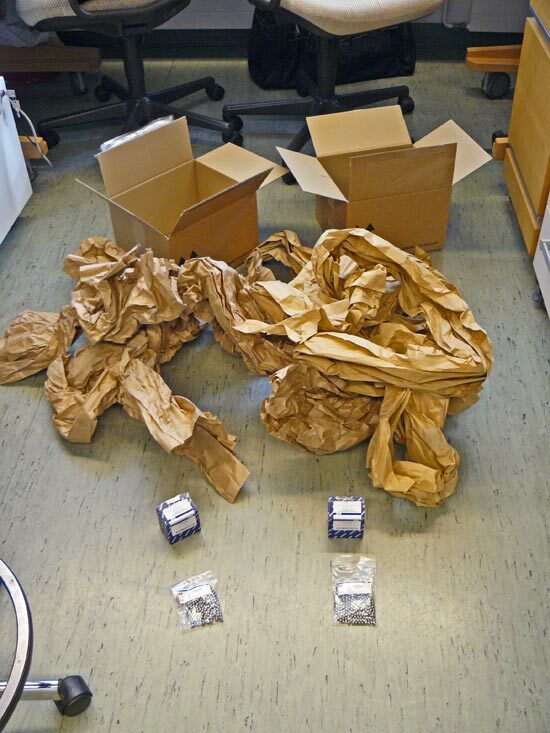 I should say thanks to Nick for having posted yesterday some pictures of Sigma-Aldrich packaging madness. Packaging has a cost and an effect on environment, however, as Nick correctly points, some chemicals shipped by Sigma are dangerous and this might justify some excessive packaging. This morning I received some chemically-inert stainless steel beads that I'm using to extract RNA with the Tissuelyser, my preferred method. My bench-mate Shawon received some too. Despite we are from the same lab, from the same address, and from the same center of cost, Qiagen sent us two different parcels, therefore doubling the shipping and handling taxes, and doubling CO2 emissions. The picture shows the amount of stuff required to send 400 x 5mm stainless beads (in the small plastic bag). Our lab paid 352 dollars (subtotal) plus 41 dollars (shipping and handling). This packaging, which costs me 10% of my research budget, offends me every time I make an order, so I've been looking for alternatives. After some common sense thinking, my conclusion is that these are not complex chemicals, but simply inox beads with a diameter of 5 millimeters, nothing more than bearing balls. Next time, saving 60% of my budget, I could get 400 stainless steel bearing balls for 160 dollars.